Dubai, UAE, May 14, 2018: Wearing make-up to the gym is still an on-going debate, as many believe it can cause skin problems such as congested pores, acne and skin inflammation – not to mention the mess that make-up can cause when smudging or fading. While many of us wouldn't go as far as wearing a full face while working out, we still strive to look effortlessly pulled together. The Body Shop has come up with the Sportify line, which is a waterproof make-up line that will enhance your natural beauty and still look polished after hours of working out. A water resistant and sweat-proof brow tint that is suitable for sensitive skin and perfect for individuals looking for enhanced brows that won't smudge while they enjoy an active lifestyle. The mistake-proof, buildable tint formula provides long-lasting colour and coats every hair leaving brows looking naturally fuller. Also, the slanted felt tip nib allows for precise application, and the non-permanent tint doesn't stain the underlying skin, but stays in place all day, even throughout a workout. Directions of use: Sweep the slanted nib over the brows for more defined, fuller, darker, natural-looking brows and build the colour until it reaches the desired intensity. Waterproof mascara that is suitable for sensitive eyes and perfect for individuals looking for enhanced lashes that won't smudge while they enjoy an active lifestyle. The highly pigmented formula provides length and definition and is easy to remove with a waterproof make-up remover. The brush enables easy, buildable application, and the pack size makes this the perfect product to take away for a poolside holiday. The smudge, sweat, flake and waterproof formula stays in place all day, even through your workout. 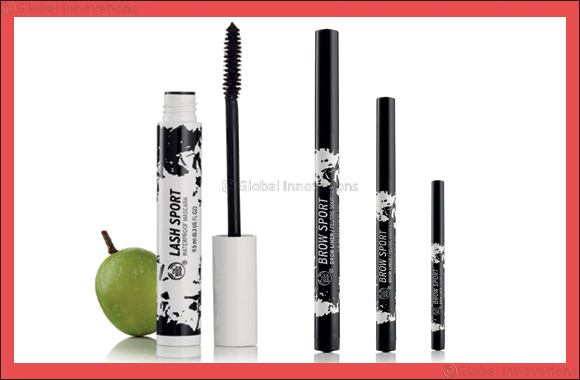 Directions of use: Apply one or more coats of Lash Sport Waterproof Mascara to clean, dry lashes. The Sportify make-up range is available for purchase in all Body Shop stores across the GCC.